The best defense against cold and flu season is a healthy diet, especially leading up to the germiest time of year — the winter months immediately following the holiday season. Your diet determines your gut microbes, and your gut microbes are the defenders of your universe. Feed them well with vegetables, fruits, and fermented foods, and they’ll stick up for you when the bad guys invade. Right after the holidays, after overindulging in candy canes and pies and rolls and casseroles, and muddling through holiday stress coupled with lack of sleep, our immune system may not be in the best shape for fighting off the germs or bacteria passed on to us through kisses on the cheek, doorknobs, or anything that has gone airborne by way of neighborly coughs and sneezes. A poor diet is no match for these germs, and once they settle in, there’s little that can be done to stop the onset of the sniffles. It’s not impossible, however, to reduce and lessen symptoms if you suddenly notice a tingle in the throat or a tickle in the nose, indicating the beginning of a cold or flu. One effective way to reduce the duration and severity is with elderberries. This longtime, homeopathic remedy for strengthening the immune system and warding off illness received such high accolades, the scientific community took notice and started running tests on the native European berry. Results revealed the berry’s ability to reduce the duration of, and lessen the severity of cold and flu symptoms were comparable to the likes of the popular flu medication, Tamiflu. Imagine, a natural, no additive, no preservative, unprocessed, honest berry as powerful as a synthetic medication. The berries deliver even more super power than its comparable synthetic counterpart. Elderberries naturally provide high doses of flavonoids, vitamins A, C, B6, iron, and potassium; contain anti-inflammatory and anti-cancer properties; and the fiber in fresh berries is considered to be one of the most effective ways to reduce cholesterol. Fresh berries have a tart flavor, similar to cranberries or unripe blackberries, but can be difficult to find, so I rely on the organic dried variety. When dried, elderberries develop dark, brooding coffee and chocolate notes, almost currant-like and slightly sweet. 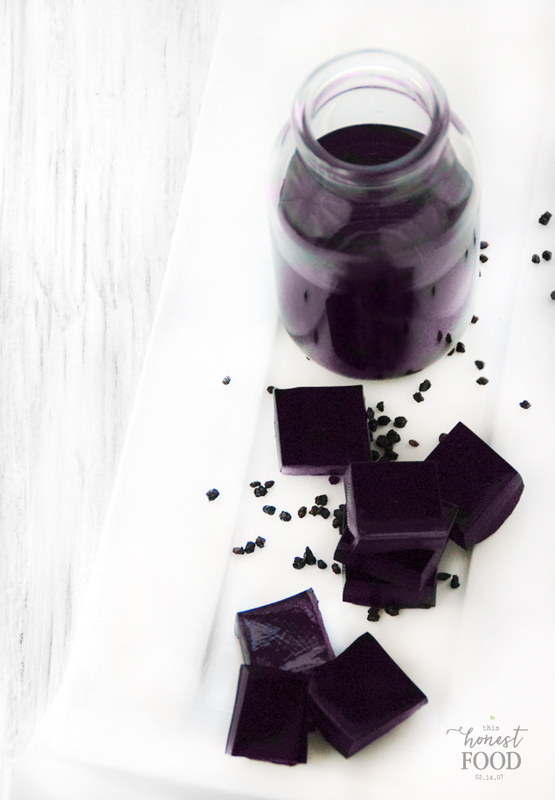 Elderberry syrups can be purchased in health food stores in the cough syrup section or online, but they can be expensive and often contain additional unnecessary ingredients. Syrups are also boiled and reduced, which can destroy much of the immune-boosting properties of the berry in the process, even if you make them at home. Gentle extraction through steeping however, is simple, quick, and retains all of the berry’s super food qualities. A single batch can be served as a tea, mixed with raw honey and kept in the refrigerator as an elixir, or combined with grass-fed gelatin and turned into jellies. In a medium saucepan stir together berries and water. Cook over medium heat, stirring occasionally until liquid begins to steam. Do not simmer, do not boil. Remove from heat. Let stand 20 minutes. Strain, gently pressing berries to extract all of the liquid; reserve liquid. Return strained berry liquid to pan. Place pan over medium-low heat, stir in gelatin until melted. Do not boil. Refrigerate 30 to 40 minutes or until set. Remove from refrigerator, cut into shapes or remove from molds. After straining, berries can be frozen and used in smoothies or added to compost. P.S. If you liked this post, please take a moment to use the buttons below to share it with your best besties, so they can be their best, happiest, healthiest selves, too. You can also subscribe to This Honest Food below so you don’t miss an honest to goodness thing.